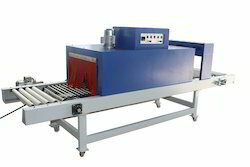 We offer optimum quality Shrink Tunnel to our valuable customers. Owing to the rugged construction, continuous operation and minimal maintenance, these tunnels are highly demanded in the market. The offered tunnels are available with us at highly affordable market prices. We are engaged in the manufacture and supply of Industrial Shrink Tunnel that is specifically designed and developed to cater to the varied clients. Equipped with I.E.S listed control panel and blower cooled rollers, these tunnels are appreciated and accepted for their robust construction and longer functional life. Shrink tunnels also consist of twin bearing idler sprockets and heavy-duty hollow pin chain. 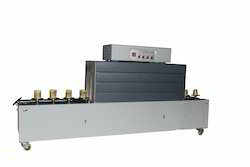 We are one of the few names that is involved in the manufacturing and supplying of supreme quality Label Shrink Tunnel. Made using high-grade metals and alloys sourced from reliable vendors, the whole range of high quality tunnels offered by us is guaranteed of superlative quality. 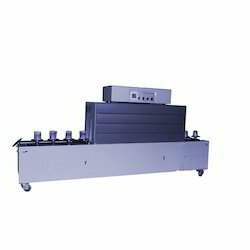 The offered product is further widely known for its shrink temperature control. We are a highly acclaimed name that is engrossed in the manufacturing and supplying of premium quality Bottle Label Shrink Tunnel. The offered product is widely praised for its long lasting life, speedy operation and corrosion resistance. Made in accordance with the predefined industry standards, the entire range of high quality products offered by us is assured of utmost quality. 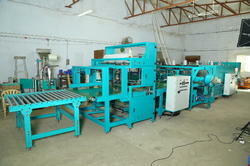 We are engaged in offering excellent quality Shrink Packing Machines. These are highly acclaimed in the market . We customize the machines catering to the Paper Industry.